Harvard’s soon-to-be 29th president strolled into Loeb House the morning of his confirmation unnoticed and under the radar. Past presidential candidates snuck through garages or up back-service stairways to avoid media attention as they met secretly with the Board of Overseers, Harvard’s second-highest governing body, to seek the group’s majority vote required to confirm their appointment. But not number 29. 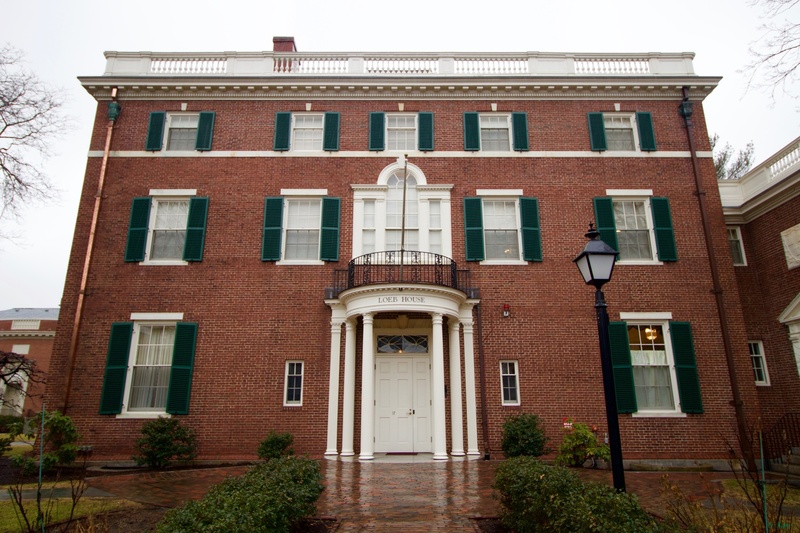 He walked right up to Loeb House’s white door on a rainy Sunday at 9:58 a.m., passing two Crimson reporters waiting outside, without once seeking to conceal his identity or hide his face. He did not even dip his umbrella. He did not have to—anyone watching would have expected him to be there anyway. After eight long months and more than 700 nominations, the search committee had settled on one of its own: Harvard Corporation and former search committee member Lawrence S. Bacow. Bacow—whose name escaped press speculation throughout the search—exited Loeb a few hours later as the University’s president-elect. The Overseers’ vote to confirm a leader from within the selection committee itself is without precedent in recent Harvard history. Corporation and search committee member Shirley M. Tilghman said Bacow traded the title of searcher for candidate in December; the committee began interviewing Bacow, along with other presidential possibles, a month later in January. Bacow chose to step down after other searchers asked him if he was willing to be considered and he said yes, Tilghman said. In many ways, the committee’s search this year was not too different from past presidential searches, either. 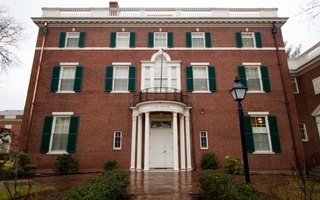 Like search committees of yore, the 2017 iteration solicited input from a wide range of Harvard affiliates and alumni; criss-crossed the country to garner advice from prominent players in higher education; and sought to keep the process totally confidential, meeting in out-of-the-way places like residential Belmont, Mass. and repeatedly declining to comment on the search. But ultimately—unlike in past years—the committee’s final pick was always hiding in plain sight. The idea had been germinating for a while. 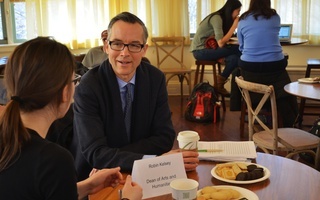 Lee said during a press conference Sunday—after officially naming Bacow the University’s 29th president—that individuals interviewed by the search committee suggested Bacow early in the process. The committee spent the first few months of the search in “information-gathering” mode, talking to hundreds of Harvard affiliates and reviewing presidential nominations. At first, Bacow himself dismissed the idea as ridiculous, the president-elect said during the Sunday press conference. “And then there came a point in which Bill Lee, the senior fellow, turned to me and—maybe you should describe what happened next, Bill,” Bacow said Sunday, addressing Lee. Lee pointed to that car ride home from the airport. By that time, several Harvard faculty members had contacted him “directly” to propose Bacow. Lee said his musings in the vehicle eventually led him to realize it would be “irresponsible” not to at least ask Bacow if he was interested. “At least from my perspective, that was the moment,” Lee said. Lee did not specify when this moment occurred, but it may have come soon before Bacow’s December decision to step down from the committee. At that point, the searchers had been hunting for the successor to University President Drew G. Faust for roughly five months. The committee—comprising all 12 members of the Harvard Corporation and three Overseers—formed three weeks after Faust’s June 2017 announcement that she plans to step down in summer 2018. In December, The Crimson reported the searchers had narrowed their pool of finalists to under 20 names. In the weeks that followed, the committee whittled that list even further, holding clandestine meetings to grill potential presidents for hours behind closed doors. The searchers gathered in committee member Tracy P. Palandjian’s Belmont, Mass. residence on Jan. 13 and spent almost the entire day in private deliberations. During that meeting, at least two chauffeured cars with tinted windows—perhaps bearing candidates—passed in and out of Palandjian’s long, concrete drive. The committee likely met with candidates during at least two other weekends in January, holding the interviews in both Boston and New York City, according to documents obtained by The Crimson. By late January, though, the searchers knew what they wanted. Tilghman said Sunday the search committee was certain Bacow was “the right candidate” for at least two weeks before the Feb. 11 announcement. Bacow—having checked with his wife, Adele—was on board. All that remained was to tell the Overseers. Hailing from around the world, they descended on Cambridge the weekend of Feb. 10: nearly all of the 30 members of the Board of Overseers, the Harvard Corporation, and some members of the Harvard Alumni Association. Almost no one knew ahead of time the weekend would culminate in the selection of the University’s 29th president. Those who did know—and even those who didn’t—largely kept their mouths shut. Members of the three bodies held at least two meetings in Loeb House over the course of the weekend: one Saturday evening and one Sunday morning. In the waning hours before the announcement, Overseers as well as Corporation and HAA members—treading the brick paths that bisect the green lawn in front of Loeb and skirting Crimson reporters—almost all refused to comment. At 6 p.m. Saturday, several members of all three groups arrived at the front door of Loeb for a reception and dinner. Attendees said Overseers normally gather for a meal the night before official meetings. John P. Reardon, Jr. ’60, former executive director of the HAA, arrived at the dinner sporting a Harvard Crimson basketball hat and wielding a bluish-black umbrella. Asked what he was doing at Loeb House, Reardon commented on the weather instead. The Harvard men’s basketball team toppled previously undefeated Penn Friday, 76-67. The next morning, Overseers began trickling into Loeb around 9 a.m. Members of the Corporation joined the Overseers roughly an hour later, many of them trekking on foot from the nearby Charles Hotel. Not Corporation member and searcher David M. Rubenstein, though. Rubenstein—spotted wearing a black-and-grey sweatsuit and walking through the lobby of the Charles earlier in the morning—rode in a chauffeured black Cadillac from the hotel to Loeb a few minutes after 10 a.m.
On arriving at Loeb roughly a quarter of an hour later, Rubenstein declined to say what he was doing there. “I don't know, I'm lost at the moment,” he said. Rubenstein’s fellow Corporation member and searcher Paul J. Finnegan took a slightly different tactic to evade reporters. Approached walking into Loeb House, Finnegan did not answer questions but noted he’d been following the Winter Olympics. He pointed out that a Harvard hockey player is currently competing for Team U.S.A.
At 3:15 p.m. on Feb. 11, the months of silence broke. Lee took the stage in Harvard’s Barker Center to officially and finally name Faust’s successor. “I have the great honor and privilege of introducing you in a few moments to the 29th president of Harvard University, Larry Bacow,” Lee said. 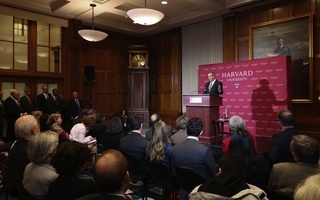 Bacow, smiling and wearing a Harvard tie, approached the podium, shook Lee’s hand, and thanked the clapping crowd. Moments after stepping down from the stage, Bacow gathered his family—his wife and his two sons—for their first-ever photo as Harvard’s next first family. Later, leaving the press conference, several search committee members—finally willing to speak—praised Bacow’s qualifications and said they were excited to see him assume Harvard’s top job. “I’m absolutely thrilled,” search committee and Corporation member Susan L. Graham ’64 said. Searcher and member of the Corporation Kenneth I. Chenault added he thinks Bacow will be able to approach the top job from a worldly perspective, allowing him to connect well with those beyond the University’s gates. Near the close of the day Feb. 11, though, Bacow hardly wanted to speak at all. Approached by Crimson reporters as he exited Loeb House around 6 p.m., Bacow said he is excited to lead the University but felt almost too worn out to stand. —Staff writers Luke W. Vrotsos, Molly C. McCafferty, Sarah J. Hong, Truelian Lee, Shera S. Avi-Yonah, and Alexandra A. Chaidez contributed reporting. In an email Tuesday, the Corporation's senior fellow also solicited suggestion for “individuals you believe warrant serious consideration as possible candidates,” and listed a series of criteria the selection committee is considering.